Introducing… The Soda Shop Message Boards! Fans of Adventures in Odyssey, The Odyssey Scoop, and other fan sites out there, get ready to experience The Soda Shop Message Boards, a gathering place for Adventures in Odyssey fans everywhere. 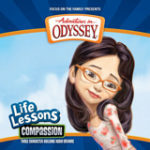 We needed to fill a void on The Odyssey Scoop and provide a way for fans to connect and discuss the world’s #1 audio drama: Adventures in Odyssey. The Soda Shop Message Boards provide a safe environment in which listeners can connect and discuss, speculate, and relate to each other―all in an online community that reaches out. We understand that there are larger scale message boards in the AIO online community to allow for fans to discuss anything and everything from Adventures in Odyssey to prunes (and we recommend them!). The Soda Shop Message Boards have been provided mainly to discuss Adventures in Odyssey―a more narrowed down message board pertaining to Focus on the Family’s popular audio series for “tweens”. Age doesn’t matter at The Soda Shop. Feel free to step up to the counter and join the conversation. Welcome to the Soda Shop. We hope you enjoy your time here. Head over and register your free account today and join the conversation!